Are you a big music fan? Kick off your summer with one of the most popular events in Pigeon Forge. Some of the top bluegrass bands on the scene today head to Dollywood every year for the annual Barbecue and Bluegrass Festival. While you listen to the music, you can dig into juicy barbecue favorites like saucy slabs of ribs, perfectly pulled pork, and finger-licking chicken. This year, the kick-off date is Friday, May 24th and the music runs through Sunday, June 2nd, so you have plenty of time to enjoy this cherished tradition of Southern fun. This music series is free with your admission to Dollywood. It's well worth carving out a few extra vacation days or scheduling a long weekend with the kids. You don't want to miss the 2019 festival, so make your hotel reservations now before the rooms fill up. Our Smoky Mountains hotel is perfectly located just a few minutes from Dollywood. You and your family won't miss one minute of Barbecue and Bluegrass when you book a guestroom at Ramada Pigeon Forge. Whether you have been a passionate fan of bluegrass your whole life or you are just discovering this beautiful style of music, Dollywood is known for attracting an award-winning lineup of bands. And the best part? Admission is free with your ticket to this Pigeon Forge theme park. All you have to do is take a look at the schedule and decide which singers you want to see. 2019 welcomes perennial favorites and newcomers to this Dollywood tradition. Find your favorite bluegrass artist and mark your calendar. Along with the main acts on The Plaza at Wilderness Pass Stage, you'll find up-and-coming acts roaming around the theme park. Keep your eyes and ears open because you just might be treated to an impromptu concert that will have you tapping your toes all the way to the next ride. With so many bands taking the stage and lots of tasty barbecue on the menu, this free music festival in Pigeon Forge attracts people from all over the country. The bluegrass concert event is free for all ticket holders to Dollywood. Once you buy a pass to this Smoky Mountain theme park, you won't have to pay any extra charges to enjoy the music. You can purchase a one, two or three-day pass depending on how much music you want to see. They even offer special offers, add-on, and season passes, which are especially handy if you live in the Pigeon Forge region. Are you ready to experience Barbecue and Bluegrass? Take a look at all of the available Dollywood ticket options, then decide which is best for you. And don't forget to bring your appetite to Dollywood! 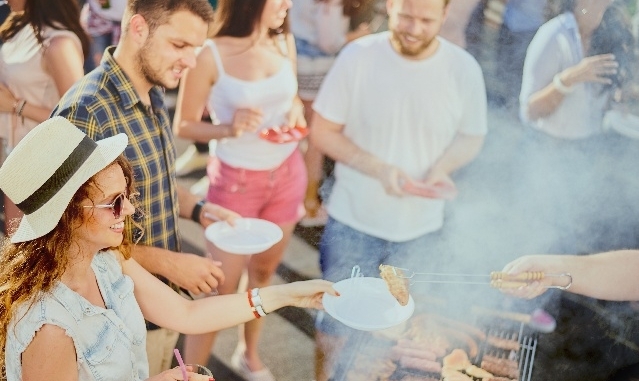 Some of the country's finest barbecue masters will be on hand to serve up succulent classics from baby back ribs and spicy links to barbecue beef tips and mountains of pulled pork. Dish up your saucy favorites with all the fixings and get ready for a lip-smacking good time. Barbecue and Bluegrass will leave you and your stomach very happy. Is all that talk of barbecue making your hungry? Satisfy your taste buds and reserve your accommodations for the 2019 Barbecue and Bluegrass Festival. Our Pigeon Forge hotel is your home away from home in the Smoky Mountains. Located just a few miles from Dollywood, our affordable guestrooms and one-room suites offer a relaxing atmosphere with Southern hospitality. Start each morning with a complimentary breakfast with hot and cold items. If you want to take a break from the festival, you can take a swim in our indoor pool or get a quick workout in at our modern fitness center. See all of our hotel amenities for your Pigeon Forge visit. After a fun day at the Barbecue and Bluegrass, you and your family can unwind in your comfortable room. Watch your favorite program on your flat-screen TV with premium cable channels or surf the web and stream a movie with high-speed Wi-Fi. In the morning, you can wake up to a fresh pot of coffee in your room and keep drinks and snacks cold in your mini-refrigerator. Reserve your Dollywood hotel room now to lock down the dates for your upcoming vacation.